Frescoed façades in Bad Tölz. 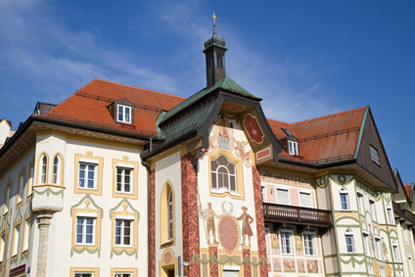 Bad Tölz is a beguiling spa town with frescoed façades and an Alpine atmosphere. A favourite playground for Munich residents both in summer and winter, the area offers good rafting down the Isar River, hiking and skiing on the Blomberg mountain, and above all the swimming, water games and relaxation at the Alpamare centre - including Europe's longest waterslides.